The Maastricht Debate, taking place on Monday 29 April, will bring together the candidates for the presidency of the European Commission to battle out key issues on the future of Europe. The debate will be held in front of an audience of 500 young people and livestreamed by POLITICO Europe. There will be a debate-watching festival on the Vrijthof square in Maastricht. The festival will include stands for European, national and regional parties and organisations, as well as food trucks and live music after the main event, to encourage the “debate after the debate”. The focus of The Maastricht Debate is on youth, with a special emphasis on first-time voters. The moderators, Rianne Letschert, rector of Maastricht University, and Ryan Heath, political editor at Politico, as well as voters and members of the audience will question the Spitzenkandidaten along three main themes: Digital Europe, Future of Europe, and Sustainable Europe, a theme sourced by a survey conducted by Maastricht University. The leading candidates of the main European political parties are expected to participate in the debate. 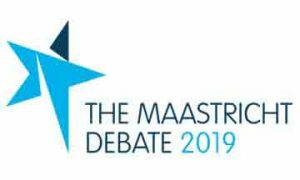 The Maastricht Debate 2019 is being jointly organised by the three partners of Maastricht, Working on Europe – Maastricht University, the City of Maastricht and the Province of Limburg – as well as the European Youth Forum and the European Journalism Centre.